Karl and Tina loved the idea of a Disney wedding, but not the price tag that often comes with that. In their search for alternatives for their intimate ceremony, they found Intimate Weddings of Orlando and Victoria worked with them to create the perfect ceremony location for the couple and their two daughters. Paddlefish at Disney Springs in the Walt Disney World Resort fit the bill for them. With beautiful views of the lake and above the hustle and bustle of the shopping area, it fit them to a tee. The team of vendors that Intimate Weddings of Orlando put together for them was absolutely fabulous. Flowers by Lesley worked with the vision the couple had for their flowers. Bouquets filled with garden roses, calla lilies, and peonies filled the ladies hands, as burgundy ribbon graced the bouquet stems and a hidden mickey lay in wait inside one of the blooms. 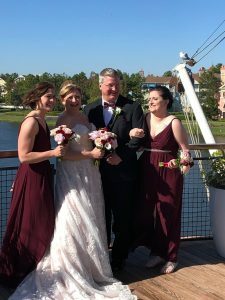 Edmund Rhodes with Rhodes Studios Photo and Video started his day at the couple’s resort (Port Orleans Riverside) From getting ready pictures, family shots, individual portraits, and then off to Paddlefish for the ceremony and some incredibly fun pictures. Edmund caught every moment for the day. Rev.Glynn Ferguson with the Orlando team of Sensational Ceremonies worked with the couple to create a beautiful and touching ceremony. Rich in love and laughter, the ceremony spoke of love, friendship, loyalty, fidelity, and trust.